What Was Christ Writing on the Ground? Then the legislator of morality and human conduct stooped down, and with his finger wrote on the ground, as though he heard them not (John 8:6). What did the Lord write in the dust? The Evangelist maintains silence concerning this and does not write of it. It was too repulsive and vile to be written in the Book of Joy. However, this has been preserved in our Holy Orthodox tradition, and it is horrible. 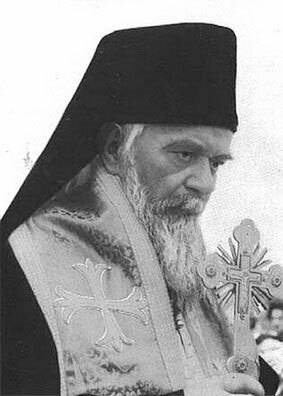 Bishop Nikolai, a gifted theologian combining a high level of erudition with the simplicity of a soul steeped in Christ-like love and humility, is often referred to as the “new Chrysostom” for his inspired preaching. As a spiritual father of the Serbian people, he constantly exhorted them to fulfill their calling as a nation: to serve Christ. During WW II he was imprisoned at the Dachau concentration camp . He later served as a hierarch here in America, where he died. Once, the All-loving Lord was sitting in front of the temple in Jerusalem, nurturing hungry hearts with His sweet teachings. And all the people came unto Him (John 8:2). The Lord spoke to the people about eternal bliss, about the never-ending joy of the righteous in the eternal homeland in the heavens. And the people delighted in His divine words. The bitterness of many disappointed souls and the hostility of many of the offended vanished like snow under the bright rays of the sun. Who knows how long this wonderful scene of peace and love between heaven and earth would have continued, had not something unexpected now occurred. The Messiah Who loves mankind never grew tired of teaching the people, and pious folk never grew weary of listening to such healing and wondrous wisdom. What did they do? Perhaps they had caught the leader of a band of brigands? Nothing of the sort. They forcibly brought forth an unfortunate sinful woman, taken in the act of adultery; brought her forth with triumphant boasting and crude and deafening cries. Having brought her before Christ, they cried: Master, this woman was taken in adultery, in the very act. Now Moses in the law commanded us, that such should be stoned: but what sayest Thou? (John 8:4-5; cf. Lev. 20:10, Deut. 22:22). It would have been appropriate to ask why these elders and guardians of the law did not stone the sinful woman themselves? Why had they brought her to Jesus? The law of Moses gave them the right to stone her. No one would have objected. Who protests, in our day, when the death sentence is pronounced over a criminal? Why did the Jewish elders bring this sinful woman to the Lord? Not to obtain a commutation of her sentence or clemency from Him! Anything but that! They brought her with a premeditated, fiendish plan to catch the Lord in words contradictory to the law, that they might accuse Him as well. They hoped with a single blow to do away with two lives, that of the guilty woman and that of Christ. What sayest Thou? Why did they ask Him, when the law of Moses was clear? The Evangelist explains their intent in the following words: This they said tempting Him that they might have to accuse Him (John 8:6). They had lifted their hands up against Him once before to stone Him, but He had eluded them. But now they had found an opportunity to accomplish their desire. And it was there, before the Temple of Solomon, where the tablets of the commandments had been kept in the Ark of the Covenant, it was there that He, Christ, had to say something contrary to the law of Moses; then their goal would be attained. They would stone to death both Christ and the sinful woman. Far more eager were they to stone Him than her, just as they would later with even greater zeal ask Pilate to release the bandit Barabbas instead of Christ. All of those present expected that one of two things would happen: either the Lord in His mercy, would release the sinful woman and thereby violate the law; or He would uphold the law, saying, Do as it is written in the law, and thereby break His own commandment of mercy and loving kindness. In the first instance He would be condemned to death; and in the second, He would become an object of mockery and derision. When the tempters posed the question, “What sayest Thou?” a deathly silence fell: silence among the crowd which had gathered; silence among the judges of the sinful woman; silence and bated breath in the soul of the accused woman. A great silence falls in large circuses when the tamers of wild beasts bring forth tame lions and tigers and command them to perform various movements, to assume various positions and do tricks at their behest. But we see before us no tamer of wild animals, but the Tamer of men, a task significantly more difficult than the former. For it is often harder to tame those who have become wild on account of sin, than to tame those who are wild by nature. What sayest Thou? once more they pressed Him, burning with malice, their faces contorted. Then the legislator of morality and human conduct stooped down, and with his finger wrote on the ground, as though he heard them not (John 8:6). What did the Lord write in the dust? The Evangelist maintains silence concerning this and does not write of it. It was too repulsive and vile to be written in the Book of Joy. However, this has been preserved in our Holy Orthodox tradition, and it is horrible. The Lord wrote something unexpected and startling for the elders, the accusers of the sinful woman. With His finger He disclosed their secret iniquities. For these who point out others’ sins of others were experts in concealing their own sins. But it is pointless to try to hide anything from the eyes of One Who sees all. After this our great Lord arose and kindly said to them: He that is without sin among you, let him first cast a stone at her (John 8:7). This was like someone taking away the weapons of his enemies and then saying, Now, shoot! The once haughty judges of the sinful woman now stood disarmed, like criminals before the Judge, speechless and rooted to the ground. But the benevolent Saviour, stooping down again, wrote on the ground (John 8:8). What did He write this time? Perhaps their other secret transgressions, so that they would not open their closed lips for a long time. Or perhaps He wrote what sort of persons the elders and leaders of the people should be like. This is not essential for us to know. The most important thing here is that by His writing in the dust He achieved three results: first, He broke and annihilated the storm which the Jewish elders had raised against Him; second, He aroused their deadened consciences in their hardened souls, if only for a short time; and third, He saved the sinful woman from death. This is apparent from the words of the Gospel: And they [the elders] who heard it, being convicted by their own conscience, went out one by one, beginning at the eldest, even unto the last; and Jesus was left alone, and the woman standing in the midst (John 8:9). The square before the temple was suddenly empty. No one was left except those two whom the elders had sentenced to death, the sinful woman and the Sinless One. The woman was standing, whereas He remained stooped towards the ground. A profound silence reigned. Suddenly the Lord arose again, looked around, and, seeing no one but the woman, said to her: Woman, where are those thine accusers? Hath no man condemned thee? The Lord knew that no one had condemned her; but with this question He hoped to give her confidence, so that she would be able to hear and understand better what He would say to her. He acted like a skillful doctor, who first encourages his patient and only then gives him medicine. No one has condemned you? The woman regained the ability to speak, and she answered, No man, Lord. These words were uttered by a pathetic creature, who just before had no hope of ever uttering another word, a creature, who most likely was feeling a breath of true joy for the first time in her life. Finally, the good Lord said to the woman: Neither do I condemn thee; go, and sin no more (John 8:10,11). When the wolves spare their prey, then, of course, the shepherd does not wish death for his sheep either. But it is essential to be aware that Christ’s non-judgment means much more than the non-judgment of humans. When people do not judge you for your sin, it means that they do not assign a punishment for the sin, but leave that sin with and in you. When God does not judge, however, this means that He forgives your sin, draws it out of you like pus and makes your soul clean. For this reason, the words, “Neither do I condemn thee,” mean the same as Thy sins are forgiven thee; go, daughter, and sin no more. What unspeakable joy! What joy of truth! For the Lord revealed the truth to those who were lost. What joy in righteousness! For the Lord created righteousness. What joy in mercy! For the Lord showed mercy. What joy in life! For the Lord preserved life. This is the Gospel of Christ, which means the Good News; this is Joyful News, the Teaching of Joy; this is a page from the Book of Joy.